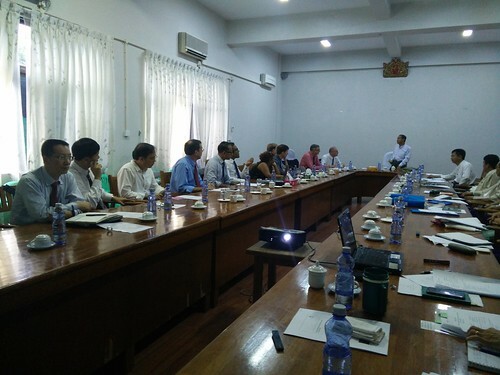 A meeting between CGIAR centres and the Ministry of Agriculture, Livestock and Irrigation (MoALI) was held on 26–29 September 2016 in Nay Pyi Taw, Myanmar (photo credit: IWMI). In recent years Myanmar has undergone a series of political, social and economic transformations that have fostered an atmosphere of stability that is conducive to growth and development. While the country remains one of the poorest in Southeast Asia with inadequate infrastructure and one of the lowest per capita incomes in the region, the new government’s policies and reforms are modernizing its agricultural, industry and service sectors. This wave of transformation has also opened up opportunities for increased cooperation between the government of Myanmar and international agencies and nonprofit organizations, with specific attention to poverty alleviation, rural development and an improved quality of life. A meeting between CGIAR centres and Myanmar’s Ministry of Agriculture, Livestock and Irrigation (MoALI) held 26–29 September 2016 in Nay Pyi Taw, Myanmar, explored increasing research collaboration, partnership and capacity development of the country’s scientists, extension workers and farmers. Officials of MoALI, led by Tin Htut, permanent secretary for Agriculture, met with lead scientists from the International Livestock Research Institute (ILRI), the International Center of International Agriculture (CIAT), the International Food Policy Research Institute (IFPRI), the International Rice Research Institute (IRRI), the International Water Management Institute (IWMI), the International Potato Center (CIP) and WorldFish. Iain Wright, ILRI deputy director general – integrated sciences, and Randall Ritzema, a Hanoi-based ILRI scientist, represented the institute at the meeting. Participants discussed the need to develop research capacity of the ministry through training and shared projects, and they explored longer-term opportunities for joint research facilities and support for improving extension and uptake of research. Ye Tun, director general for livestock at MoALI, said the ministry’s activities and priorities include breeding, animal health and forage and fodder. He said the ministry was interested in research collaborations in these areas with ILRI and CGIAR. 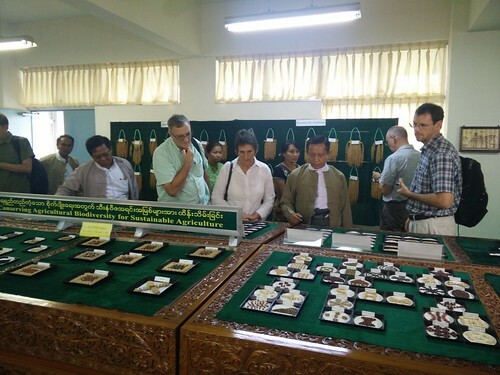 Wright and Ritzema also met with representatives of the University of Veterinary Sciences in Nay Pyi Taw and in initial discussions identified mycotoxin and anti-microbial resistance as areas of common interest with high potential for collaboration. CGIAR centre representatives at the meeting also reviewed CGIAR research work in the country. They discussed platforms for engaging jointly in research-for-development in Myanmar and defined both short- and longer-term partnership modalities for coordinated efforts. At present, IRRI and WorldFish have signed a memorandum of understanding MoALI and have offices in the country, while IWMI and CIAT are hosted by IRRI Myanmar’s country office. The meeting was a positive ‘first step’ for ILRI’s future engagement in Myanmar. In the coming months, Wright and Ritzema will work with partner CGIAR centres and MOALI to develop a formalized partnership agreement, and to identify projects and funding sources to catalyze ILRI’s longer-term presence in the country. See an earlier article on CGIAR’s work in Myanmar and other countries in Mekong region. Read about a coordination meeting between CGIAR centres and Vietnam’s Ministry of Agriculture and Rural Development. Tags: CIAT, CIP, Iain Wright, IFPRI, IRRI, IWMI, MoALI, Myanmar, Nay Pwi Taw, Randall Ritzema, WorldFish. Bookmark the permalink.